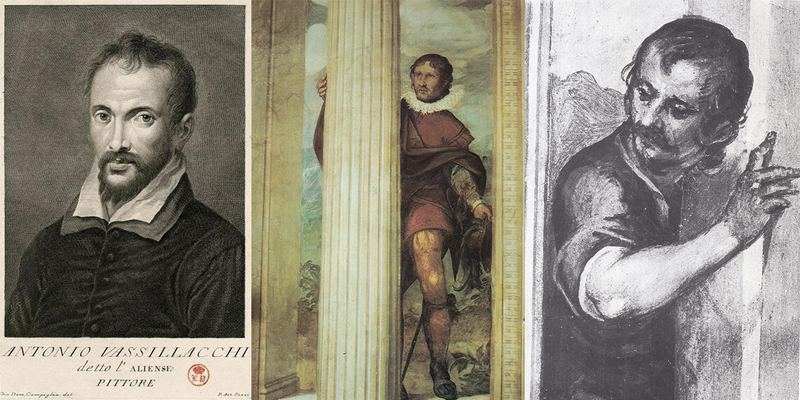 Antonio Vassillacchi known as “l’Aliense” was born in 1556 in the Greek island of Milo. He moved to Venice as a young boy and joined Paolo Veronese’s workshop, but he soon was influenced by Tintoretto’s dramatic luminism and strong light and shade effects. He was a member of the Venetian painters’ “Fraglia” between 1584 and 1621. His artworks are placed in the middle of the Counter-Reformation Age. The Aliense’s work in Padua, Venice, Salò and Perugia (where he painted ten large canvas for the church of S. Pietro) is documented by a great number of paintings. He partially returns to Veronese’s style in his frescoes of Villa Emo in Montecchia and of Villa Barbarigo in Noventa Vicentina, as one can see in his choice of colder tonalities; however, the rhythm of narration is quite different from Veronese’s severity and classical serenity. The Aliense died in the 15th of April 1629.